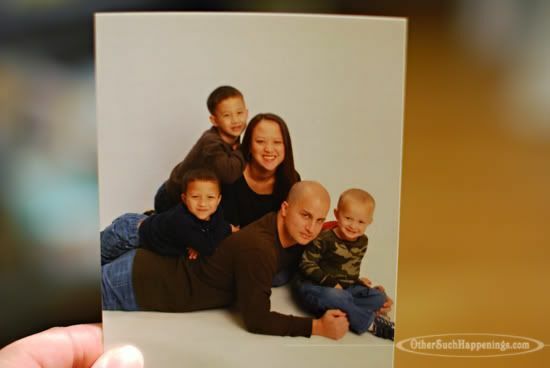 Melissa is working on a family photo project and asked her friends when they last had their family photograph taken. I will never forget our last family photo that was taken in February 2008. I had a coupon for The Picture People at the mall. (This was before I purchased my Nikon.) I was determined to get a family photo-- not just of the boys or David and the boys, but Daddy, Mommy, Austin, Noah and Christian-- ALL of us! After many poses, half-blinked eyes and dorky expressions, we just couldn't seem to get it together and produce a decent picture. The photographer suggested splitting us up and trying to get one of just the boys together. I remember telling her "No, I came for the sole purpose of a family photo with ALL of us together! I don't want to leave until I have it." So we stuck it out and came up with this that hangs in our living room. I wish we had ordered some of the other poses... or paid the big bucks for the ginormous black and white enlargement. I just thought "We'll get that next time when I can get a better picture of all of us, one where we are all looking straight at the camera." Only "next time" never came. I went back to the store at the mall. With tears in my eyes, I asked them if I could order the other poses that we didn't deem "good enough". I wanted to get the enlargement that I had passed up before. But it was too late. They were already out of the system, gone forever. I left with even more tears. We used it for our Christmas cards that year. Don't procrastinate your family picture. Don't assume you will get another chance. Don't dismiss the imperfect ones so quickly. One day you will look back at those very pics and love them! You will see that your children's fake smiles, funny faces or even tears were a memory and moment in time captured. And you will see that their mommy and daddy are beautiful, even if they thought they were fat or unphotogenic at the time. Real life, normal, the every day, family... go capture it now. And go get in the picture yourself! this made me cry. i'm so glad you have that photo! 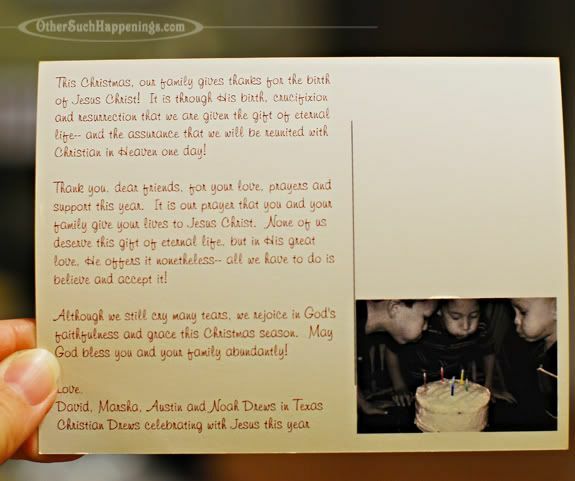 Aw Marsha, I remember getting that card and thinking how thankful I was at that time that you had that photo of your family. I don't have a family photo. We took some a couple of years ago that was our Christmas card, but I never had any printed. I could still do that as I have the files on my computer, but we don't have a current one. I did put those in a book I had made though. I love it. I need to have a current family photo taken for sure. Maybe this summer. Thing is, I don't want to just hand my camera over to anyone now. I'm finding that I've gotten pretty picky. Wish you lived closer, you could take them! Oh wait, there is your sis. Maybe because I grew up in a family full of professional photographers - but I get pictures done of us constantly! We get a new family shot at least once every two years! I take pics all the time. The ones missing are the ones of me!!! I'm the one behind the camera most of the time. I do a family photo calendar for us and for some of the family each year. This has made me seek out different combinations of photos for the calendar. The kids know when I say 'That's a calendar shot!' it is a really good picture that captured them for real and will probably end up on the family calendar the following year! LOL! I can't wait for this Christmas to go stateside and get our new family photo!!! It will have Butterfly in it this time! Yippee! So true. Capture those moments while we can. We tend to live expecting tomorrow, yet we just don't have that promise. I love the photo you have to treasure. I've told so many mammas to make sure they are in the pictures too. So many times we are the photograper or we "want to wait until we've lost weight" etc. I was so grateful for the pictures taken of our family during Christmas 2007. There were a couple of me & Peyton and I love them. This brought tears to my eyes. Our friends sent out a family photo for Christmas and the dad passed away only a few months later. I look at that picture every Christmas, and I know for a fact that they treasure it. I have been putting off our family picture all year. Thanks for the reminder. I am so thankful for your faithful testimony. Great post. I often hit the delete button a little too quickly, especially with photos of myself. It's those extra pounds that somehow attached themselves to my body. I'm so glad you went and got those pictures done and made her keep taking the shots until you had one. I wouldn't have even put forth that much effort. Did you see the post a while back about moms not waiting to get in the frame? That one cut me to the heart. and now yours has driven the knife in further. I *need* to stop making excuses! I'm with you, SO many times I didn't want to shell out the big bucks... just the special offer picture or small package. This is a good reminder of how important these records of memories are. It's a good thing you always had your camera handy at home... can you imagine what'd be like if you hadn't?! oh. so terrible. I'm glad you have so many precious pictures of Christian and these family ones too, even if they aren't as big as you'd like. This post made me cry...how you point others to Jesus even in your grief. So beautiful! I am not good about wanting to be in pictures. I am glad someone took pictures of me with our little Rebekah. My only regret is that there are none with Dale and me and Rebekah. I'm so glad you stuck with it and ended up with this photo. It's really hard for us to get a family photo, especially with a son at college (& another one will be leaving for TX for school in August). I've got to make a point of getting one this summer. 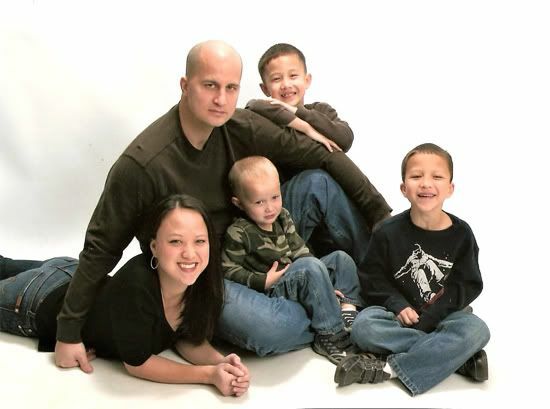 When I was waiting on my cancer diagnosis... knowing I had cancer, not knowing what type, knowing that treatment would start immediately, not knowing when I'd begin to lose my hair... a family photo suddenly became a huge priority. We, too, ended up at the Picture People at 8 o'clock at night where we got our first family photo in over 6 years!!! It's beautiful! :) I couldn't believe the peace I had after I got that photo. Somehow, I was okay with dying now that it was done...And now I need to order those enlargements!! I think we have one family photo and that was taken 9 years ago. I have been saying that I want some taken this year, because everyone is home for the summer. I need to get on that and make it happen. Wow. So very true. Thank you for sharing this. I know I needed it and I'm sure so many others did as well. Thank you, thank you, Marsha, for that reminder. You always put things into perspective for those of us who are blessed to read your words. Oh Marsha! I had lost your site for way too long. I am so happy I came across it again, I have so missed reading your blog posts. You are bookmarked, and I am thrilled. Just love your sweet family. And now...with tears in my eyes...I say Thank You...for sharing and for reminding us to live in the "now"...THANK YOU! I LOVE your family picture, God Bless you. I'm so glad they were able to retrieve those photos for you. You're so right about the family photo. Our family hasn't taken one in years, but I've taken thousands (literally) of pictures of/my children, alone and together, but I've never been in any of them. 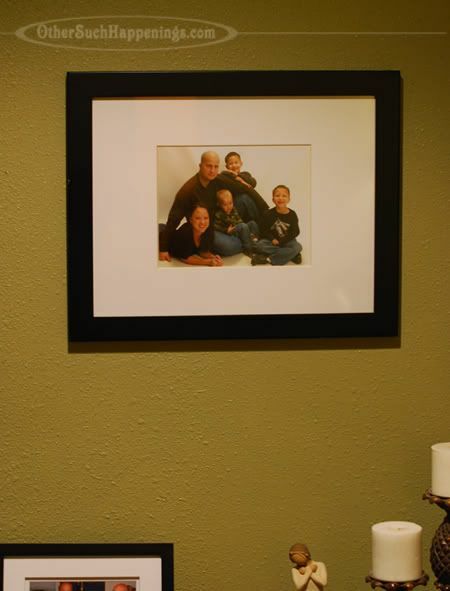 I'm going to ask my husband to get a shot of all five of us and then a picture of my children and me together. ((hugs)) Thank God you have that wonderful family photo & that you could get the other pose too! What a GREAT reminder to seize the moment!!! THANK YOU! I wish you could have gotten the others from the studio but I'm so happy that you at least have this picture. And I'm simply honored that you shared it with us. The day I got it in the mail I hung it up on our family's prayer board. We still pray for you guys regularly. The kids can't wait to meet Austin and Noah one day! Wow. Beautiful pictures, powerful post. Wow. OH WOW...what a true reminder to treasure every moment and make every memory that we can!!!! I'm not 100% of your story, but have read a few posts on your journey...I'm always moved by your words and am SO thankful that you're a sister in Christ! oh. we haven't had a family photo in ages (ever) with all of us (parents and kids) and I don't know what I have been waiting for. I remember that card...and I have been convicted about our family photo. Especially since I'm rarely in a photo because I don't like my hair, clothes, face etc.